Two and a half months ago, Terry Pratchett passed away. I didn’t say, or write much about it at the time. It felt wrong to expound upon my feelings about the man. Despite the fact that he’s my favourite author. Despite the fact that my bookshelves are still laden with his books (and associated Discworld spin-offs and recipe books and maps). I’m never really comfortable with online obituaries – unlike personal remembrances or traditional newspaper memorials, they feel tainted by the need for ‘hits.’ I’ve read tributes to Pratchett that are transparently written by writers saddled with a deadline and a wordcount, writers who’ve only read a handful of his books but espouse a deep personal connection with the man. Tributes that make the story about them, not him. I didn’t want to write about Terry Pratchett then, because it felt selfish. Because I couldn’t write about Pratchett without writing about me. I couldn’t write about Terry Pratchett without writing about Mrs Patterson. Mrs Patterson was my Year 7 English teacher at Wesley College, Glen Waverley. She was sick, with an illness I didn’t understand and don’t remember. She wore these slender white compression gloves – I think because she was sick. She was the kind of teacher who inspires not with exuberance but with a deep, quiet passion for her subject. She resonated with the glow of knowledge, the joy of learning. She held your attention simply by exuding the confidence that she what she was talking about mattered. In Grade 7 I wanted to be an author. I’d just moved on from writing the first couple of chapters of novels that never eventuated to short stories. About halfway through the year, I showed her a couple of my short stories. Two pages each in 10 point font. One was about a boy trapped in a closet by his older brother; the other about a boy who found an abandoned mouthguard and imagined where it could have come from, what it meant. They were simple stories, imperfect and likely clumsy, but she saw something in them. She praised them, she discussed them with me, she helped me make them better. She cared. That kind of interest invigorated me. I would bring her my folder of stories as they accumulated new additions and she would go over them with me. She organised a lunch time meeting with an older student, with whom I spoke about the craft of writing. Because of Mrs Patterson, I tried to submit my stories to writing magazines (they sent me very polite rejection letters). Because of Mrs Patterson, I went on a writing camp – the only student from my school to attend. Because of Mrs Patterson, I felt like my creativity mattered. At the end of Year 7, she gave me a gift – the first, and perhaps only, time I’ve been given a gift by a teacher. 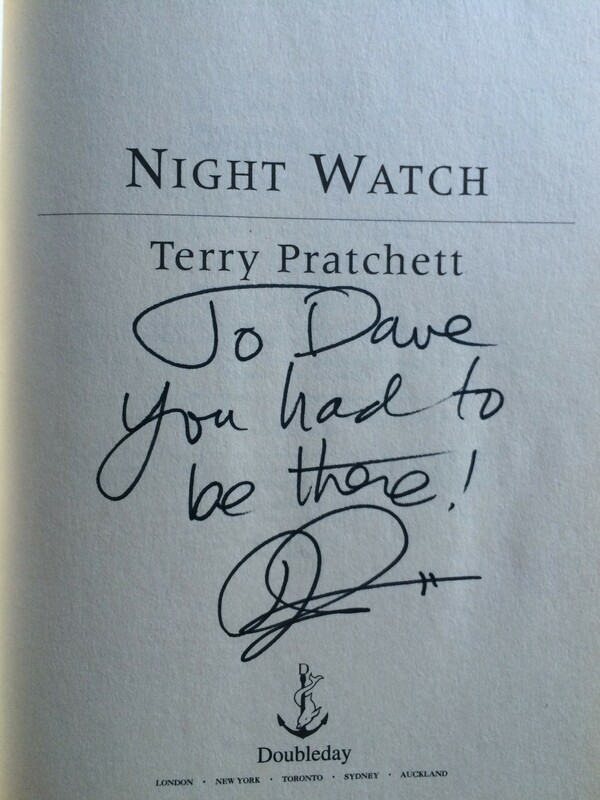 It was Wyrd Sisters – Terry Pratchett’s sixth Discworld novel. She’d written a note on the inside cover. I can’t remember its precise contents – and the book has since disappeared, perhaps thoughtlessly traded in at a second-hand book store – but I do remember that she pointed out the novel’s numerous homages to and parodies of Shakespeare. Wyrd Sisters wasn’t my first exposure to Pratchett’s writing. In Year 5, I’d embraced his Truckers trilogy – I can still recall gleefully repeating a joke about “breaking the sound barrier” to my friends and parents, the first pun I can remember getting – and moved from there to his Discworld series. The first Discworld novel I read, Mort, entranced me with its archaic fantasy and clever humour, all bundled up with reflections on death and dying that, at the time, were revelatory. I used to read Mort to my brother by his bedside, putting on my deepest, gravelliest voice for Death’s ALL CAPS dialogue. I loved his writing – it served as the connection between the escapist fantasy that had transfixed me in the preceding years and art and history and culture. When I discovered the internet, I would fastidiously pore my way through the “Annotated Pratchett File” – APF for short – which catalogued in obsessive detail the numerous references to history and literature dotted throughout Pratchett’s books. I learned more than I ever did in English or History here, because it mattered; it opened up a world of intricate complexity that hadn’t existed before. His nuanced, generous morality shaped my thinking – ideas of justice, and fairness seemed intuitive, obvious in his books. Terry Pratchett made me want to be a writer. He made writing look stupendously easy and intimidatingly difficult simultaneously. I’m not a humorous writer. I could never hope to possess even a skerrick of his intelligence, his wit, his talent, the fierce way his personality shone through in all his writing. Mrs Patterson made me want to be a writer too. She encouraged me; not blindly, but with advice and criticism that demonstrated her confidence that I could be a better writer than I was. I don’t remember the context, but I remember one day – in passing, in one of those idle conversations teachers have with teenagers about what they ‘want to be when the grow up’ – her telling me that I would be a great critic. I don’t know if she’d put any thought into the observation, but it stuck with me. She passed away not long after, from the illness that I don’t remember. But I remember her. I remember her when I try to write, when I put together a sentence or struggle for the right word. I remember her when I survey the suite of Pratchett novels clustered on the top shelf of my bookshelf. I try to remember her when I teach, as well, when I talk to students about their interests or their passions, to remember the power of an offhand comment. I try to be some shade of the writer Pratchett was. Some shade of the teacher she was. I remember them. ← Hot Chip – Why Make Sense? You call it selfish, but I call it a fine way to pay tribute to two remarkable people who passed the torch of writing on to you. You have one of the finest blogs out here, Dave. I love your sophisticated writing style and your film reviews. I would enjoy reading your stories. What a gift!